• Given the increasing attention of consumers to product quality and safetythis paper illustrates. • An original adaptive storage assignment policy for temperature-sensitive products. 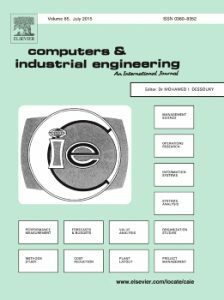 • An original bi-objective integer programming model addressing storage efficiency and safety. • A policy for warehouses that handle temperature-sensitive products in presence of high demand and weather seasonality. • A multi-scenario what-if analysis applied to a 3PL warehouse of biomedical products. The increasing attention of consumers to product quality and safety raises new challenges for logistics. Enhancing the operation efficiency and mutually ensuring the safety and quality of the handled products are key levers for logistics providers and other operators in temperature-sensitive supply chain. Handling the temperature conditions experienced by the inventory is valuable in warehouses and any other points along the supply chain where products pause for long periods. 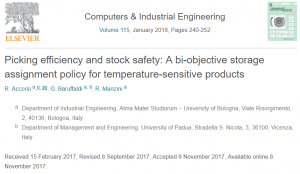 This paper proposes an original adaptive storage assignment policy for temperature-sensitive products, which enables to mutually manage both efficiency and stock safety goals. This policy is based on a bi-objective integer programming model and an original solving algorithm. We intend our policy for warehouses that handle temperature-sensitive products in presence of high demand and weather seasonality and strong inventory mix turn-over. To the best of authors’ knowledge, this is the first attempt to integrate into a storage assignment policy the issue of stock quality conservation, the optimization of the picking activities, and the management of weather and demand seasonality at the warehouse. A multi-scenario what-if analysis was applied to a 3PL warehouse of biomedical products to validate the policy and explore its insight in a real-world application. This policy autonomously balances the management of the inventory between the efficiency and stock safety levers and records savings of 12% of the picking travel time and up to 20% of the inventory safety. In conclusion, this policy assesses how the warehouse infrastructure can respond to the demand and weather seasonality in accordance with the efficiency and safety requirements.